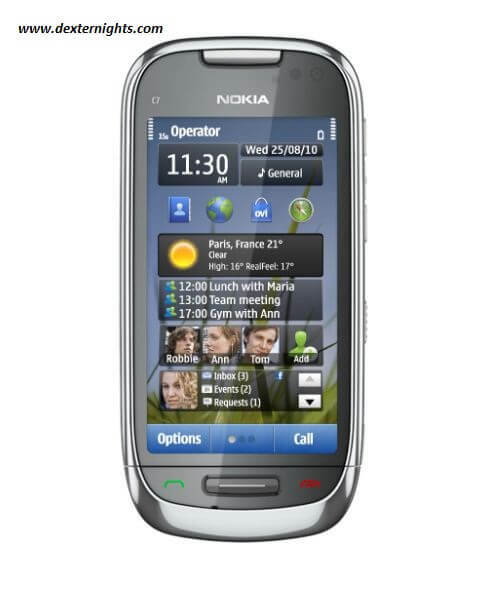 Nokia C7 is a smartphone with Symbian 3 OS, ARM 11 680 MHz processor 3D graphics hardware accelerator, 3G features include High Speed Downlink Packet Access 10.2 Mbps and High Speed Uplink Packet Access 2 Mbps. The display screen is of Active Matrix OLEDs (AMOLED) capacitive touchscreen, 3.5 inches, 16.7 million colors, UI auto-rotate, scratch resistant screen, finger touch control, on-screen alphanumeric keypad and full keyboard. 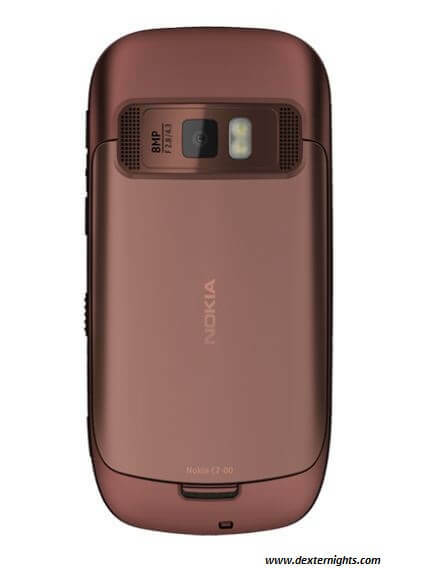 The phone has 8 MP camera with dual LED flash, face detection, geo-tagging, and video stabilization. While looking at battery power the phone has Li-Ion (lithium-ion) standard battery of 1200 mAh therefore a standby power of 656 h max, talk time power of 318 mins max, and 54 h for playing music is available. The other features include stereo FM, FM transmitter, games, voice command, web tv, browsers like WAP 2.0/x HTML, HTML, RSS Feeds, office tools like word, excel, power point, MS Outlook synchronization for contacts, calendar, notes and etc., also Flash Lite 4.0 and Adobe Reader are available. The phone has IEEE 802.11 b/g/n Wi-Fi, TCP/IP support, to serve as data modem, GPRS, EDGE, GSM, Bluetooth 3.0, micro USB connector and USB on-the-go. 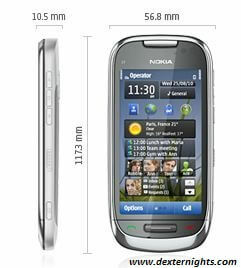 It has 8 GB memory storage, 256 MB RAM, 1 GB ROM, external memory extendable till 32 GB microSD. The audio jack is of 3.5 mm, MP3, WAV, AAC, eAAC, eAAC+, WMA, AMR-NB ringtones. The phone comes in three colors like frosty metal, mocha, and charcoal black. Battery : standby power of 656 h max, talk time power of 318 mins max whereas iPhone has standby power of 300 h and talk time power of 7 h.
Next PostNext What is a credit score ? How is it calculated ?